In a typical day, Shelby McCreedy might deal with, oh, money laundering, public indecency, intoxication, and some kind of theft. A special agent for the Iowa Division of Criminal Investigation, McCreedy “deals with bad guys all day.” But at home? “I’m like Betty Crocker—with a gun,” she jokes. Shelby is a cop who cooks. She cooks to decompress. She cooks to re-create for her family the culture of grown-at-home, scratch-made cooking she grew up with spending summers on her grandparents Iowa farm. 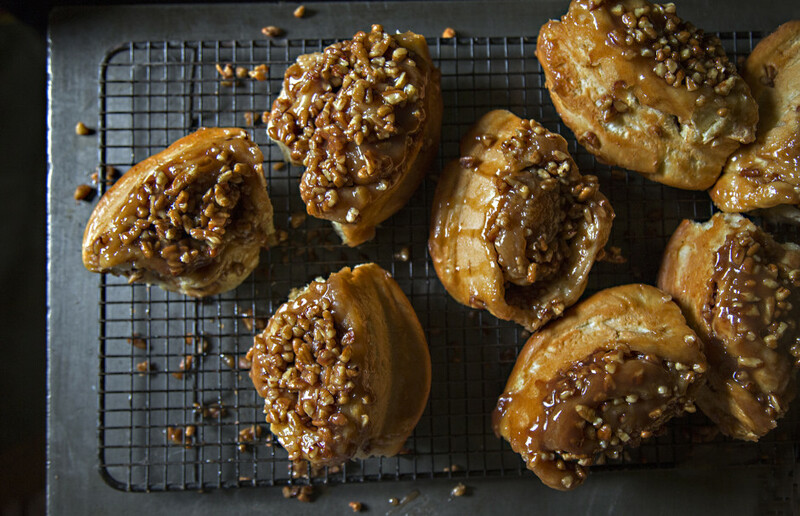 And she cooks to win, as these Caramel Pecan Sticky Buns prove. 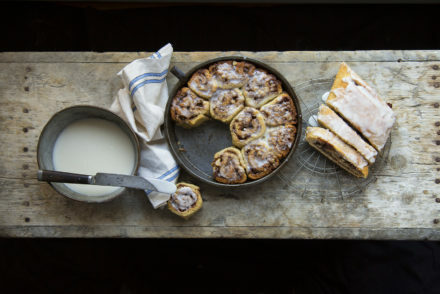 Enormous but feathery-textured, buttery, and crammed with toasted pecans, caramel, and cinnamon, McCreedy’s sticky buns won the top prize in the Best Cinnamon Roll Contest at the Iowa State Fair. It took her three tries to win the contest, and a lot of years collaborating with cooking mentor and neighbor Shari before that. “We call Shari’s kitchen the laboratory,” says Shelby. 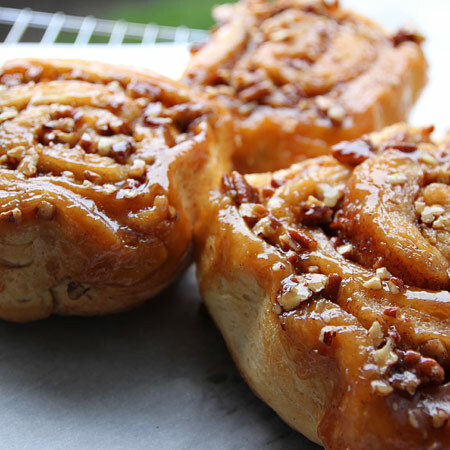 Enormous but feathery-textured, buttery, and crammed with toasted pecans, caramel, and cinnamon, McCreedy’s sticky buns won a blue ribbon at the Iowa State Fair. 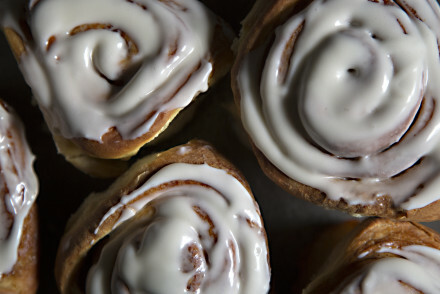 Make rolls: Combine water, 1 teaspoon sugar and yeast in a small bowl; let rest 5 minutes. Heat milk and butter until warm (100° to 110°F); butter does need to completely melt. Pour into bowl of stand mixer with 1/2 cup sugar and salt. Whisk eggs and add along with 3 cups flour and yeast mixture. Beat on medium speed for 3 minutes. Gradually add enough flour to make a soft dough. Turn out onto a lightly floured surface and knead until smooth and elastic, about 6 to 8 minutes. Place in a greased bowl, turning once to coat. Cover and let rise in a warm, draft-free place, about 1 hour, until doubled in bulk. Punch down dough and let rise an additional 1 hour. Make filling: While dough is rising, toss pecans with the 3 Tbsp of melted butter and place on a shallow baking sheet. Bake for 10 minutes until pecans are lightly toasted. Cool on a wire rack. Chop pecans. Remove 3/4 of the batch to one bowl. Set aside remaining 1/4 of the pecans for Caramel Syrup. To make filling, combine sugar, brown sugar and cinnamon with the larger portion (3/4) of chopped nuts. DO NOT ADD THE remaining 1/2 STICK OF BUTTER AT THIS POINT. Save it to spread on the uncooked dough later in the assembly process below. Make Caramel Syrup: Combine butter, brown sugar, corn syrup, and cream in a small, heavy saucepan over medium heat. Cook until syrup bubbles around the edges of the pan. Remove from heat and pour an equal amount of hot syrup into four 8-inch greased round or square pans. Sprinkle toasted chopped pecans over syrup and gently stir to coat the pecans. Set aside. Assemble rolls: Punch dough down and divide in half. Roll out half of the dough onto a lightly floured surface with a rolling pin to a 16 x 10-inch rectangle. USE THE SOFTENED BUTTER HERE: Spread the dough rectangle with half of the softened butter and sprinkle half of the sugared nut filling evenly over dough. Roll up jellyroll style. Slice into 8 rolls, placing 4 of the rolls in each of the 8-inch pans, on top of caramel syrup. Repeat with remaining dough. Cover and let rolls rise in a warm, draft-free place until doubled in size, about 30 minutes. Bake in a preheated 350°F oven for 30 minutes until golden. Remove from oven and let stand 2 minutes. Invert rolls on to serving plates or parchment paper. If you want to make these the night before to bake off next morning for breakfast, just prepare the recipe up to the point the buns are in the pans ready for their last rise. Cover well and refrigerate until morning. Bring up to room temperature and then bake off as directed.